Joseph Eybler, the man who could have completes Mozart�s Requiem (but didn�t), was appreciated more during his lifetime than since. Taught by Albrechtsberger, he composed extensively and was notably influenced by both Haydn and Mozart. Only nine years younger than the latter, he outlived Beethoven by almost twenty years. His career was cut short by a stroke in 1833, the booklet stating that this occurred whilst he was conducting Mozart�s Requiem - which sounds to me as though it might be apocryphal. About six other discs of his music are currently readily available and, although no claim of "premières" is made, there seem to be no other recordings of these works around. Don Satz was most enthusiastic about a disc of Eybler�s chamber music disc last September (review) and the reader is referred there for some more information about this neglected composer. The two symphonies on this disc seem to be Eybler�s only symphonic offerings and they are fairly early works. The manuscripts have disappeared but it is thought that they probably date from the late 1780s, making them contemporaneous with Haydn�s five that come between Paris and London (Nos. 88-92) and Mozart�s last great trilogy of symphonies (Nos. 39-41). No information at all about the Overture is provided in the documentation but my guess would be that it was composed rather later. The first symphony is in four movements and conventionally structured for the time. The opening movement has a slow introduction, and both here and in the Andante which follows, one could be forgiven for wondering whether this is some previously unknown Haydn. The slow movement is memorable, both for its graceful simplicity and for long bassoon solo in the central section. A minuet follows, and in this movement and the finale there is more evidence of individualism. But it�s all delightful � if Haydn had written this work, it wouldn�t have been forgotten until now. 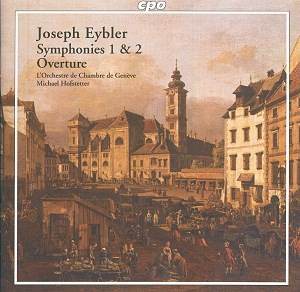 The second symphony opens darkly, apparently harking back to Sturm and Drang, but Eybler is generally more innovative here than in the previous work. There are two minuets, placed second and fourth (of five movements) and some delightful opportunities for the woodwind. The centrally-placed Andante once again catches the ear and this is also a most winning work. The overture has a dramatic, almost Beethovenian opening then it fizzes along charmingly. The lack of a title has probably contributed to its obscurity. This would be a good opener for many a concert programme. It seems strange that it is placed last on the disc. Before this disc arrived, L�Orchestre de Chambre de Genève and Michael Hofstetter were about as familiar to me as Eybler, perhaps because of relative youthfulness. Their playing is refreshingly alive and I suspect we shall be hearing plenty more from them. The recorded sound is also very good with pleasant ambience. The disc is a hybrid SACD but I can�t comment beyond the stereo. The documentation is a bit thin, particularly on the music. The overture is covered by that single word and the first movement of Symphony No. 1 is erroneously described as an "adagio in sonata form". The cover picture of Vienna by Bellotto atones a little. Overall, this is highly recommendable listening, more worthy of one�s attention than the early symphonies by Mozart currently being sprinkled around to celebrate his anniversary.